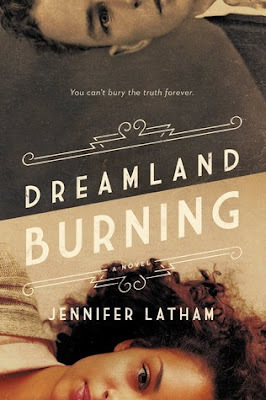 Dreamland Burning is a powerful, informative novel that sheds light on the 1921 race riots in Tulsa, Oklahoma. Jennifer Latham impressively ties together the motions of that fateful year to modern day race relations. I wondered how this story was going to work. It's told in alternating perspectives of modern day teen Rowan Chase and Will Tillman who was alive during 1921. Rowan discovers a skeleton in her home that leads back to Will's time. In the present she pushes to find answers while Will's story is superimposed to reveal some of the truths she seeks. Turns out this blend of contemporary and historical fiction works cleverly! I love that this isn't one of those stories where the MC's life is completely changed by the end of the novel. Instead, this is a story of awakening. Rowan is forced to acknowledge the racial issues still prevalent in the world that affect her, even if she's only half black. Will is a character that you think you might hate, but you can't because he's so open with his mistakes. So willing to admit when he's been wrong and has to do better. Reading the experiences of two completely different characters who are learning similar life lessons is the biggest part of what kept me reading and desperate to reach the end. I came to admire Rowan and Will because of their drive to do the right thing when it became clear that they could be apart of something bigger than themselves. One thing that I didn't like is that the modern black women are portrayed stereotypically. Not all black woman have afros or 'press' their hair. In my reality black hair is much more versatile. I'd be happy to find a book that characterized black woman as they actually see them, not as how they might expect to see them. This was a point that I kept coming to whenever a black female character was introduced, but it didn't lessen my overall experience of the story. I want everyone to read Dreamland Burning! It's a story that gets your brain moving and thinking about what you would have done in either Rowan or Will's situation. It's a story you won't soon forget, especially because it's so relevant.